This video illustrates how to use MRT Pro, an innovative data recovery hardware-software solution, to adapt Rom in Seagate F3 HDDs.It is generally used when ROM structure is damaged or terminal does not respond to commands. This video illustrates how to read and write service area tracks using MRT Pro for Seagate F3 HDD series. This video illustrates how to use MRT Pro, an innovative data recovery tool, to read and write ROM in Seagate F3 series HDDs. It demonstrates the operation of reading ROM data in Boot code mode, and writing ROM data to Flash ROM chip for Seagate F3 series HDDs. This video aims to show users the installation process of MRT Pro. The installation process includes 5 steps: Download, Unzip, Install VC runtime, Install MRT driver and Install MRT main program. To secure a successful installation, users must follow the steps shown in the video. Serial Number: Check the number on the white label of the MRT SATA Controller card. After the product being bound by MRT Lab, the user can activate the account. Step 1: Login User Centre on MRT official website with the user name. After successful login, click “Product Activation”. There will pop up a page for entering machine code. Step 2: Double-click “Mrt.exe”. If it is an inactive user, a dialog box will pop up for registration. The machine code generated by MRT will be shown in the dialog box. Paste it to the web page and click “Submit” to get the registration code. 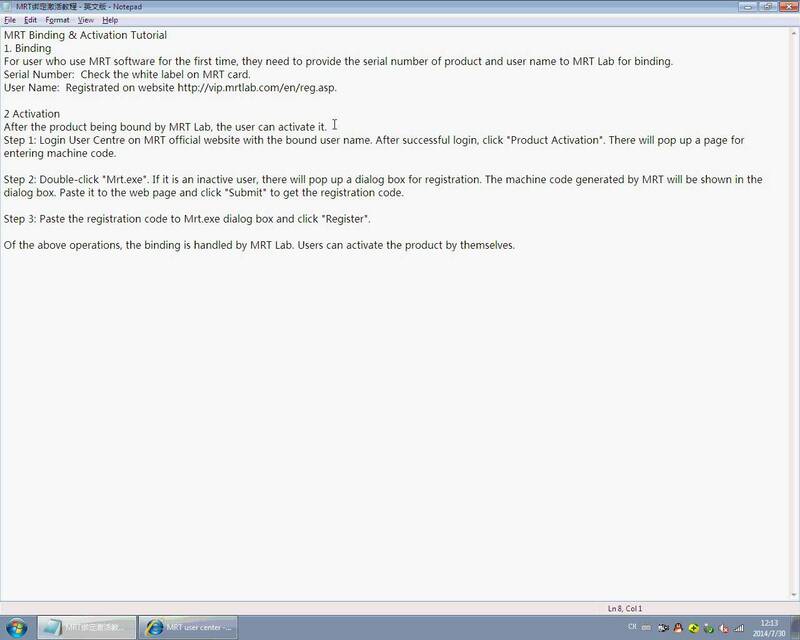 Step 3: Paste the registration code to Mrt.exe dialog box and click “Register”. Of the above steps, the binding will need to be manually processed by MRT Lab. Users can activate the product by themselves after the MRT Lab completes the binding step. 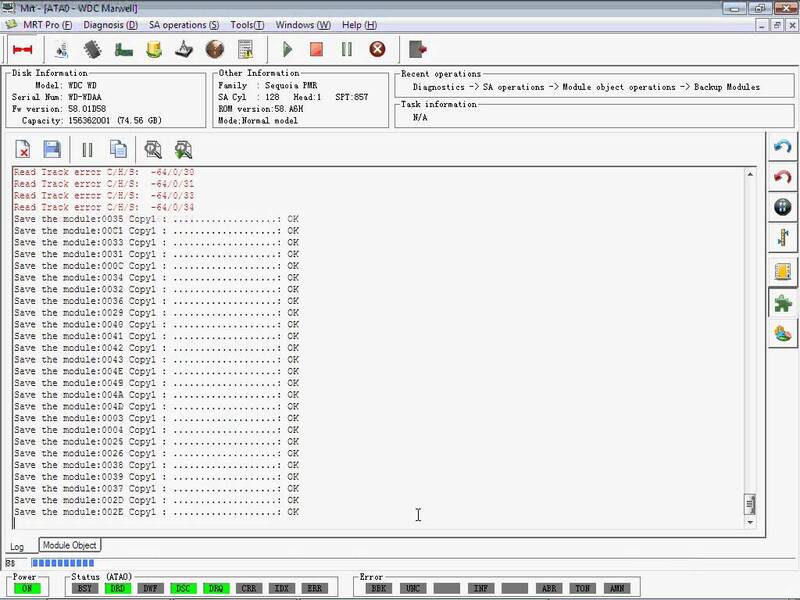 This video illustrates how to use MRT Pro to write firmware resources. Write Modules: HDD firmware mainly consists of modules. With this function, users can choose the modules they want and flash them to HDD conveniently. Write Tracks: As tracks being the carrier of module, flashing tracks can change firmware data. With this function, users can choose tracks and flash them to HDD conveniently. Write ROM: With this function, users can flash the data backed up in advance to ROM chip of HDD. 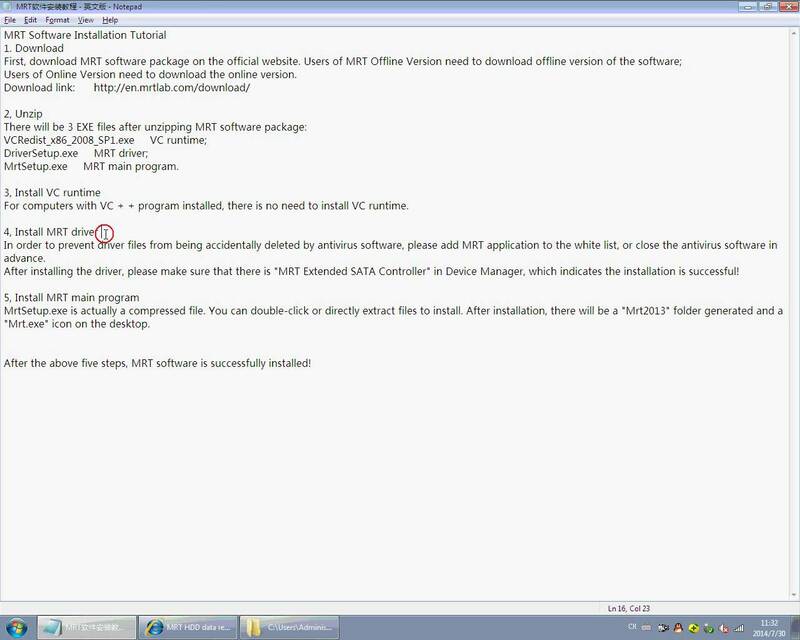 This video shows how to use MRT Pro to backup firmware for WD HDD. This can be used to back up firmware resources such as ROM, modules and tracks for later use.